Cardiopulmonary bypass (CPB) technology is relatively old. Since the first cardiac surgical operations in the early 1950s, improvements in oxygenator design, in coagulation monitoring and greater understanding of blood damage by flow rates and shear stresses have contributed to the relatively safe modern circuit. Despite all this refinement, CPB is still associated with systemic inflammatory response syndrome (SIRS), which is translated into myocardial, renal, pulmonary and neurologic dysfunction. However, although these effects are often subclinical, they can contribute to adverse postoperative outcome. 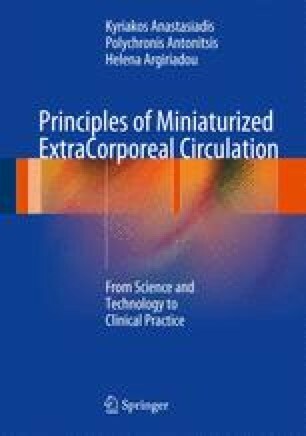 Over the past 10 years, miniaturised extracorporeal circulation (MECC) has been developed targeting in reducing the side effects of conventional extracorporeal circulation (CECC). MECC has adopted all modern technology and translated the results from research in its structures. The net outcome from the use of these systems is reduced perioperative morbidity and reduced procedural mortality as has been recently demonstrated in our meta-analysis . Anaesthetic techniques have always evolved with changes in surgical practice. Anaesthetic considerations regarding use of MECC in cardiac surgery are discussed in this chapter with the rational of enhanced recovery and implementation of fast track strategies based to the qualities of these systems.